Missing the baby-fresh complexion, the rosy glow that once graced your youth? Just try stripping down to a loincloth, wrapping yourself in chains, and screaming as block letters loom over your forehead and you, too, can feel fresh and perky once more. Your pores won’t just open – they’ll scream for mercy. Side effects may include washboard abs, inhuman rage, and neckbeard. From what I’ve gathered of the plot, this cover is actually a fairly accurate representation of what occurs in the book (I won’t go so far as to say “what the book is about”). So yes, one part of me rejoices in those cover artists who actually produce something remotely relevant to the contents of the books they illustrate. The rest of me is wishing that this one didn’t make something that looks like the dreams of a ninth-grade boy who just overdosed on Dragon Ball Z and Pepto-Bismol. “Didn’t quite convey the spirit of the tale,” you say… Ah well, blessings upon independent presses that a. have the taste and b. actually take the time to effect quality control. That is dedication. Also, is it just me or has the running theme for all the BBCF’s so far been “stuff that’s screaming and/or thrusting fists in the air”? * corrected from “first-edition;” thank you to the scarily fast John Scalzi for pointing this out. This is incorrect. The particular cover you display did not go to publication at any point. The first edition cover is in fact the one you have labeled the second edition cover. 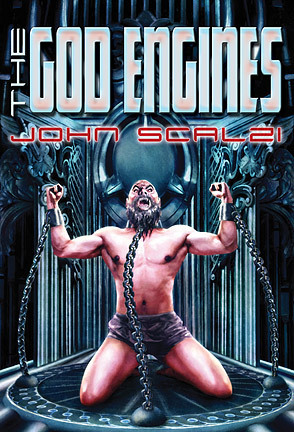 Holy crap, John Scalzi. That was fast. And, um, hello, and thank you for the correction? Sorry, I’m rather overawed/embarrassed right now. I was following SubPress’ release news for this with only one ear, so to speak, so clearly I read too quickly and misinterpreted. My mistake; I’ve edited to reflect this. No worries. You’re not the only to have confusion on that score, which is why I noted it. I enjoyed the entry! I see that really sent you asquirming Emera… haha. But yes. If that cover were indeed in the spirit of the tale… WHAT A TALE. But seriously, that is a fantastically bad book cover. Though I hope the artist still got there paycheck. Mr. Scalzi – Duly noted, and thanks for the visit! Kakaner – I hate you. SubPress’ first note on the release dubbed it “Gor-tastic,” which is just about right. Anda – I’m assuming the artist got paid either way, though I have no idea how cover contracts work, so this is quite possibly just me talking. But I’m guessing/hoping that it was a commission paid for in advance. So hopefully that helped said artist get over the snub of the art not actually being used?